The Election Commission of India (ECI) has made a special option in the voting system called NOTA (None of the above) option through which it can record that there is the percent of people who have chosen not to vote for anyone. In the December 2013 assembly elections, the ECI had directed to provide the option of None of the above, or NOTA buttons in the electronic voting machine. So as now the Indian public have an option in the Lok Sabha and state elections which can be exercised if they do not like any of the candidates. The NOTA button in the EVM machine has a pink color so that it could be recognised easily. In such situations, people were deprived of voting rights. This is the reason why the option of the NOTA was discussed so that the process of fairness in the election process and politics could be ensured. 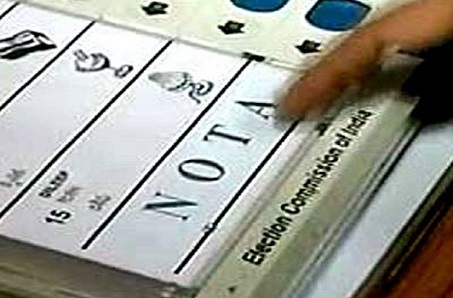 Many countries including India, Greece, Ukraine, Spain, Colombia, and Russia, the option of NOTA is applicable.